Waking up and putting my feet on the floor and going to spin class after crying for two days was not easy for me. The point is, even though I felt like dying, I’m not dead. And as long as I’m alive I have a job to do. And that job is to live. As long as I’m living, it only makes sense to live life to the fullest. As much as I want to escape that pain that I never in my life want to feel again, the only way to move on is to move through. It’s beyond my vocabulary to describe how desperately and physically I want to rip the pain from my insides and stomp on it until it disappears. It’s difficult to comprehend that in my darkest moments that there will ever again be light. It’s hard to believe that this is really the best way to tackle pain when I remember it being so much easier to numb it away with a drink or other addictive distraction. The message that I keep receiving is to ask for support and to accept that I am worthy to receive it. My bullheaded, determined self that has forever analyzed her own feelings and wants to do it all alone is reluctant. Reaching out is unfamiliar. This time, out of my familiar, I managed to up the anti on seeking support. Over and over again until I began to see a flicker of possibility that I would not be in this hurt forever and that I did not have to walk through it alone. My history of not feeling worthy enough to reach out and cry in the arms of those who are willing to hold me is an obstacle. Maybe because I am not yet to the place where I feel worthy or trust enough to be held. The intensity of my feelings this go around has brought me to a new level of desperation. My choices are to either let myself be seen or to hide and prolong the pain. I am so grateful for the direction and the offers of open arms I am receiving; for the consoling and understanding and mostly for the truth that I must feel and embrace if I am to heal. Using denial or band-aids to help me feel better temporarily is avoidance. It’s a process. When I hear my AA sponsor or someone else use the word “process” I just want to cringe. Because I know what’s coming. I know that it means that there is no magic pill for this. I know that it means that my heart which literally feels like it’s been torn in two will not repair itself in this second but in time. That logic is a difficult reality to digest for someone who grew up believing that difficult feelings were a waste of time. Slowly I am coming to realize, that even though I do not invite my difficult feelings that it’s best to welcome them when they visit and its up to me to make them feel as such.They do not have to move in, though I suppose that I can be kind enough to them when they choose to stop by, even without fair warning. It’s day four since I felt my heart rip in two and I wake to the rain slamming down on the roof in a way that it commands me to pay attention. I listen to it wash away what I know in my soul to be true. I feel some of my sadness holding grip though mostly I see my hope sinking. I want to hang on but the Universe is demonstrating how to cleanse. Let it all come down. Let it pour until it has thoroughly exhausted itself. Watch the hurt and pain drown and be carried away. Let it be messy and murky and muddy. And then begin again with new possibility. I am getting another chance. The voice of my spirit is alive. I am foraging hints that I am meant to “Carry on, Warrior” as Glennon Melton Doyle has reminded me. As I lie in my bed listening, I think of my 7 college fraternity sisters who are scattered asleep around my house right now. 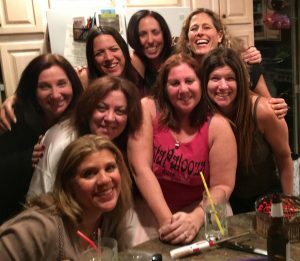 A girls slumber party that I hosted last night at nearly 50 years of age does not loose its power. We planned this sleepover before my deepest and truest love painfully decided to withdraw his convincing declaration to return back “home” less than 17 hours after proposing it to me. I was not sure that I could be present or participate in this party based on the way I was feeling just a few short days ago and I certainly did not want to burden anyone. I went through with it anyway and it’s been an amazing blessing. I have been delivered an affirmation from each and every one of them all in their unique ways and I have allowed them to carry me and begin to fill my tank with droplets of worth. For the first time in ever, I am beginning to trust it. The gifts of my girls that have been sprinkled about this house since dinner time yesterday have appeared in the form of laughter, so much so that the pain of brokenness has been replaced with that of stomach pain from laughing too hard, mostly at silly innocent things. Singing and dancing has appeared instead of lying fetal and lethargic, under the covers. Free flowing conversation instead of secrets bottled inside. Acceptance has trumped judgement. And a new level of truth and validation is on the rise. With their help, future plans of joy are being made with certainty and not the voice of insecurity. I am paving my own future with possibility for things that are in my control and not at the mercy of others. Kindness, hugs and declarations of love have drowned out the untrue accusations and attacks that have haunted me in the past few days. I could not be carried in this way unless I allowed it. Choosing to expose myself and allow the support has been humbling. It all started to sink in for me as Bono’s message blasted through the spin room yesterday morning to close out the class: “We get to carry each other, carry each other, One…” (Though first we have to surrender to it). The fact that it is a process translates to a greater feeling of security and an opportunity for growth has been seized.